One of the most common dental procedures needed by adults are crowns which are sometimes called “caps”. Teeth, just like all of the other parts of our body, break down as we age. As teeth begin to decay, they become more prone to cracking and breaking. There are many possible causes of this damage to your teeth. These reasons can include bruxism (teeth grinding), general decay, cracked fillings, root canals, and many others, but for all, the end result is the same: a crown is needed. If your tooth is beyond repair with a filling material, it is recommended that the best viable option to save the tooth is a crown. 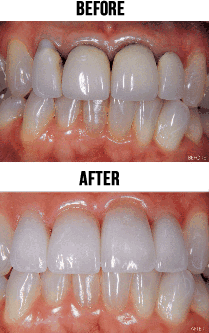 The reasons for this type of restoration in a badly damaged tooth are durability, cosmetic appearance, and overall support of the chewing function. If it is decided that you are in need of a crown, there are different types of crowns that patients can get for the repair of their tooth. These options include a full porcelain crown or porcelain fused to metal. When you visit Crane Family Dentistry, they will make the determination as to which of these options is the most appropriate for your situation depending on the state of your damaged tooth. You can be comfortable in knowing that your new crown will be virtually unnoticeable and will flawlessly complement the rest of your smile. PFM - Porcelain fused to metal on top of a stray metal base. Looks great and lasts long. All Porcelain - Empress or E-Max create an incredibly lifelike beautiful tooth. Great for front teeth or where ideal aesthetics are needed.